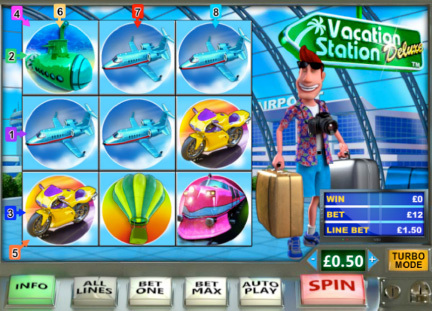 Fly Casino is pleased to present Vacation Station Deluxe online slot! This classic “8 liner” game is an upgrade to the classic version that Fly Casino players have loved to play for years. Based on the classic 8-line games of the early days, each symbol box reels independently and allows you the chance to get many different types of winnings combinations. It is possible to get 8 of the same symbol! This game is very easy to play. It’s a nice change of pace from the regular video slots. This beloved classic game is so popular that a deluxe version was absolutely warranted. 110% up to 110.00! From 00:00GMT until 23:59 GMT, all members on their deposit of just $/£/€10 or more will receive a 110% bonus up to 110.00. 150% Big Money Tuesday! From 00:00GMT until 23:59 GMT, all members are invited to receive a 150% bonus up to $/£/€150.00 on your deposit of just $/£/€10 or more or more. Super Thursday! From 00:00GMT until 23:59 GMT, all members are invited to receive a 125% bonus up to 125.00 on your first deposit of just $/£/€10 or more. Wager Requirements 35X (Bonus + Deposit).